3M™ Microfinishing PSA Film Disc Roll 366L include multiple sanding discs packaged in a roll for convenience and use in high-production environments. 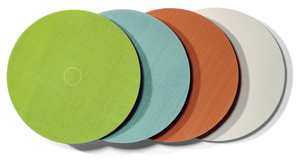 These discs are rated Best in the 3M Microfinishing line of film backed discs. 3Mâ„¢ Microfinishing PSA Film Disc Roll 366L include multiple sanding discs packaged in a roll for convenience and use in high-production environments. These discs are rated Best in the 3M Microfinishing line of film backed discs. Precision micron-graded mineral delivers an aggressive cut with uniform finish. Load-resistant coating provides greater efficiency and longer product life. Use on plastic, fiberglass, wood, metal, solid-surface composites.